Why do Bali foodies keep coming back to Ibu Oka in Ubud? The Bali-style babi guling (roast pig) served at Warung Ibu Oka is most famous for the late Anthony Bourdain's loving coverage of the restaurant and its product. While Bourdain later moved on in his affections (lechon from the Philippines later took first place in his lard-encrusted heart), Ibu Oka's babi guling still exerts a spell over the visitors who swarm to Jalan Raya in Ubud, Bali, taking time out of their schedule exploring Ubud's shopping, dining, and sightseeing to follow in Bourdain's footsteps. Warung Ibu Oka is set in a small, open-air space opposite the Ubud Royal Palace. The place is open for only four hours a day. Starting at 10:30am, when the first of six whole roast pigs makes its way to the premises atop a motorcycle. Ibu Oka stays open until the last roast pig is chopped up and served to their hungry patrons. Make no mistake, Ibu Oka serves Bali babi guling and only babi guling: chopped up and served on paper plates, these heavenly pieces of pork are best enjoyed in combination with boiled white rice, spicy vegetables, and blood sausage. The complete meal described above is known as babi guling spesial ("special roast pork", IDR 55,000, or about $3.75 – read about money in Bali), and offers the best parts of the pig: a square of crisp skin tops the slab of fatty pork meat you get with the dish, and the steaming hot rice is balanced out by the slice of blood sausage and helping of spiced vegetables beside it on the plate. It's not a pretty sight, if you're used to neat servings of Western food, but babi guling is Balinese soul food exemplified: a substantial rice and meat meal with accents of spices and grease. The contrasts play in your mouth like a melodious gamelan orchestra: the crunch of the crackling plus the softness of the rice, the granular texture of the blood sausage versus the buttery softness of the fatty pork meat. The roast pork is cooked away from the restaurant location; to make babi guling, whole pig carcasses are stuffed with various herbs and spices according to a secret family recipe: components likely include galangal, lemongrass, shallots, and garlic. After stuffing, the carcass is roasted on a skewer, turning slowly over a fire for several hours until the skin turns a rich, deep brown. The crisp, savory skin is especially prized by babi guling eaters, but the tender, seasoned meat is what gives babi guling its heft: having absorbed the secret spices during the cooking process, the meat tastes delicate and practically melts in your mouth. Ibu Oka only opened for business in 2000, but the product has a long and storied lineage: the food blog A Girl Has to Eat interviewed Agun, a cousin of the restaurant's namesake Ibu Oka, who confided that the business began in his father's time. Their family had been preparing babi guling for the Ubud royal family: given leave to sell their delicious product to Balinese commoners, the family set up a stall in the market, which eventually led to the restaurant in this prime area of Ubud. The family still prepares babi guling in the traditional way, starting at the crack of dawn by slaughtering the pigs to be served. "The roasting takes place next to Agun's house and about six pigs are roasted each day, more on festival days and on other important occasions," the blogger explains. "It's the use of the time held tradition of roasting over wood that Agun says is what gives the suckling pig its intense flavor. The fire needs to be extremely hot to both sufficiently crisp the crackling and to ensure that the bones do not break as would happen over a lower heat." That's an even bigger endorsement than anything that Anthony Bourdain could ever cook up: the reassurance that diners at Warung Ibu Oka experience an authentic, hand-crafted bit of Balinese culture that no Western influence has managed to ruin yet. The main branch of Ibu Oka is centrally located in Ubud's town square, across the street from the Royal Palace and just down the street from both the Ubud art market and the Museum Puri Lukisan. For other activities you can do within five minutes' walk of the restaurant, check out this list of 10 Things to Do in Ubud, Bali. 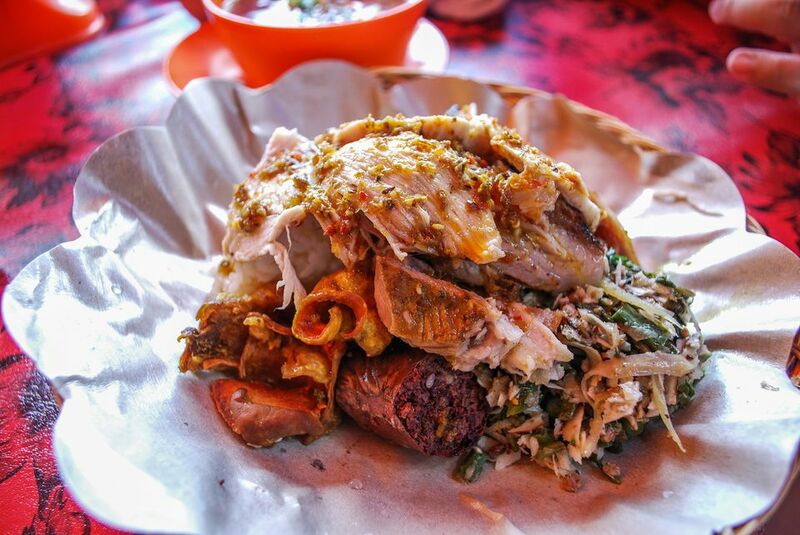 For more on the country's other eats, read a primer on Indonesian food.